The stage for The Potshot was set the year before when my mom bought my little brother Jake a set of mini football pads, helmet and jersey from the Sears Catalog. Jake had been drooling over this same set for at least two previous Christmases, and Mom even got iron-on letters and put FROST on the back of the jersey. When it showed up under the tree, Jake was over the moon. Jake insisted on packing the entire set from Arizona to Utah the following Thanksgiving for our annual Turkey Bowl game. 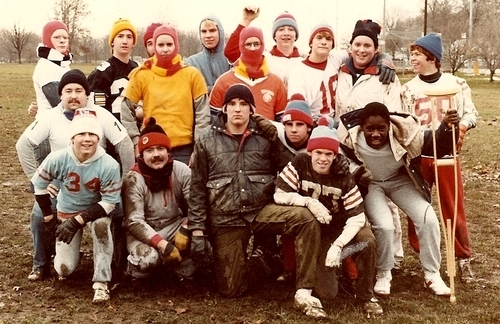 We drove to the high school soccer field with a slew of Litster cousins and when we emptied out of our vans, we had at least two dozen players decked out in mismatching cold weather gear, plus one full-fledged running back for the Philadelphia Eagles. 1. The ending score was always a tie. 2. It was a touch game. 3. If a little kid got the ball, they made a score. No exceptions. Jake and I benefitted from Rule #3 for years. One of my brothers would catch the ball and hand it off to one of us, then two other brothers would pick us up by the armpits and run us into the end zone. When we got a little older, we'd run the ball ourselves while the defensive line made an elaborate show of trying to tackle us. By '98, Jake and I were 9 and 13 and too old for such privileges, so we joined the ranks as regular players. We played for an hour before my brothers and cousins got the idea to hike the ball to our 5-year-old cousin Adam. Off he ran, the big kids blockading the defensive line from the front and all other cousins diving out of his way to give him a clear shot to the end zone. All Jake saw through his little plastic face mask was that they had finally given the ball to someone smaller than he was. He didn't hesitate. He didn't even think, "I can get away with this." He just ran out of pure instinct and tackled Adam from the side, smashing his little body into the grass. There was a collective gasp, punctuated by Adam's wails. Then the big kids pulled Jake off and started yelling variants of "What were you thinking?!" As the condemnations floated through the ear holes in his little blue helmet, Jake said it was the first time he questioned his decision to crush a small child. Needless to say, he got benched for the rest of the game. But you better believe the story of the Turkey Bowl Tackle still lives today.